Sara has been a vet for almost 3 years and has worked with wildlife and farm animals and horses as well as dogs and cats. Her main interest is in exotic species like all our vets and she also likes small backyard farm animals. 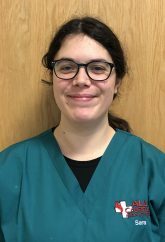 She has a love of nature and the outdoors and has always been fascinated with how animals work inside and how disease and treatments affect them so a career as a vet was always a natural choice. She volunteers for zoo and veterinary associations and helps with planning meetings in the UK and Europe. In her spare time she plays the ukulele and likes hiking, travelling and dancing. She shares a 13 year old rescue Cocker Spaniel called Milo with her partner and she says he has no manners- I hope she means Milo and not her partner!